Our 16-seater executive hire vehicles are highly preferred by corporate groups and others. These vehicles are in high demand for corporate executives to make airport transfers, indulging in excursions and team bonding missions, attend meetings, transfer to conferences, and other purposes. Many corporate groups avail these vehicles to provide regular commute for their employees. We offer special rates to corporate who avail our vehicles on a regular basis, making ou Bracknll minibus hire the best option. In fact, cost-wise, our Bracknell minibus hire is far cost-effective than maintaining your own corporate vehicles. 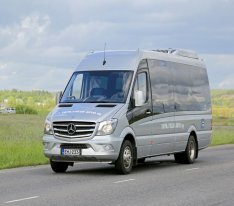 Our 16-seater executive vehicles are stylish models from reputed manufacturers such as Mercedes and Volkswagen. These vehicles offer the pinnacle of comfort, allowing your busy corporate executives to travel in style and maintain their productivity. The vehicle comes fitted with all amenities such as USB ports to connect the smartphone. Your busy corporate executives may either opt to relax and recharge their batteries in the plushwork, or finish some last minute work on their presentation. Either way, our 16-seater minibus are productivity enhancers. These vehicles also spot stylish exteriors, which enhanceyou brand value, and help your group make a powerful statement.